AUKEY and OutdoorMaster products take your outdoor activities to higher places. Functional, comfortable outdoor gear helps you physically push yourself further, while boosting your mobile technology gives you the tools to capture and share your experience on whole new levels.This spring, go #BeyondOutdoors with AUKEY and OutdoorMaster accessories. Enter our giveaway for a chance to win one of our Ultimate Adventure Packs and be fully equipped whether you are out cycling, hiking, camping and using your mobile tech outside. To win, simply tell us what item you couldn’t leave without on your adventure. Best comments will win one of our Ultimate Adventure Packs! We're giving away packs weekly so keep an eye on our Facebook, Twitter, Google+ and Instagram accounts for regular updates. Don't forget to boost your entry credits by following the easy-to-follow app activities, and increase your chance to win some fantastic adventure tech! Good Luck! As you may already know, AUKEY products implement the latest technologies to elevate your experience when using mobile devices. Many of those products are more specifically for outdoor adventure and survival. In particular, our PB-P2 solar panel charges USB devices with a solar conversion efficiency of up to 23.5%. Dual USB ports offer up to 2.4A output each or total 3.1A max output under direct sunlight with AiPower adaptive technology ensuring your USB powered devices are at the fastest charging speed. 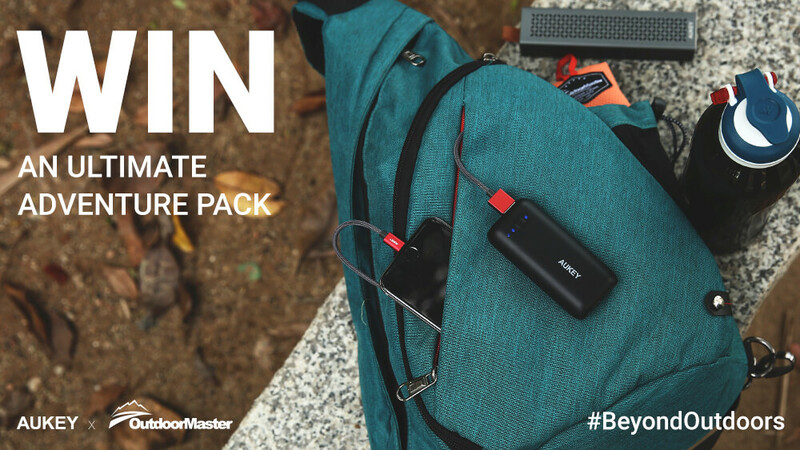 In each Ultimate Adventure Pack we will be including a PB-P2 solar panel, paired with a PB-N41 pocket power bank. The PB-P2 can be strapped to your OutdoorMaster backpack keeping your phone or power bank topped up whilst on a hike or placed in a variety of positions when you've setup camp. Both AUKEY and OutdoorMaster will be combining other tech including Bluetooth speakers, Smart Phone Lenses, shoulder bags, camping blankets, LED torches and much more within each pack - keep an eye on our social media for announcements during the week of what you can expect to win. We will be giving away a 1st and 2nd prize weekly.